Reading and share top 18 famous quotes and sayings about Falsification by famous authors and people. Browse top 18 famous quotes and sayings about Falsification by most favorite authors. 1. "A good scientific law or theory is falsifiable just because it makes definite claims about the world. For the falsificationist, If follows fairly readily from this that the more falsifiable a theory is the better, in some loose sense of more. The more a theory claims, the more potential opportunities there will be for showing that the world does not in fact behave in the way laid down by the theory. 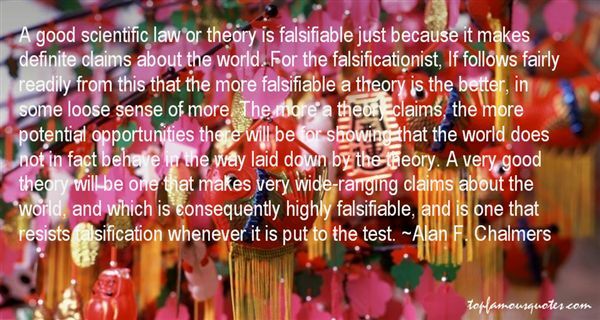 A very good theory will be one that makes very wide-ranging claims about the world, and which is consequently highly falsifiable, and is one that resists falsification whenever it is put to the test." 2. "The dark leaden mask hides the devil with a soul of deceit, with his warm syrupy vacuous words coercing, enticing and grasping with exposed sharpened claws, scratching slow at his prey's surface with bullet pointed precision, inserting the slow hot mercurial poison of falsification of love straight into the flowing veins of the succumbing vulnerable heart. The prey's wanton escape futile, isolated & drawn into the hot fiery abyss." 3. "Here we live in the illusion of happiness where we forget that we were created to handle the balance not just to bear it. We brought into being from nothingness not to live in deep wells of subconscious and be satisfied on the echoes of the convoys we came to hear. We are here to spread the wings of happiness, purposefully built in within ourselves to come out from the wells of our falsification of self and bring forth the real us …. The ones with compassion, kindness and self- esteem shaping in perfection the most gifted creation of the most powerful creator and to become part of these immortal convoys for the times to come." 4. "To make a deliberate falsification for personal gain is the last, worst depth to which either scholar or artist can descend in work or life. (Letter to Muriel St. Clare Byrne, 8 September 1935)"
5. "The falsification of scientific data or analysis is always a serious matter." 6. "We need falsifications to make the past inhabitable." 7. "24. O sancta simplicitas! In what strange simplification and falsification man lives! One can never cease wondering when once one has got eyes for beholding this marvel! How we have made everything around us clear and free and easy and simple!" 8. "When people want to be rid of Heaven it is logical to start by creating an atmosphere in which spiritual things appear out of place; in order to be able to declare successfully that God is unreal they have to construct around man a false reality, a reality that is inevitably inhuman because only the inhuman can exclude God. What is involved is a falsification of the imagination and so its destruction." 9. 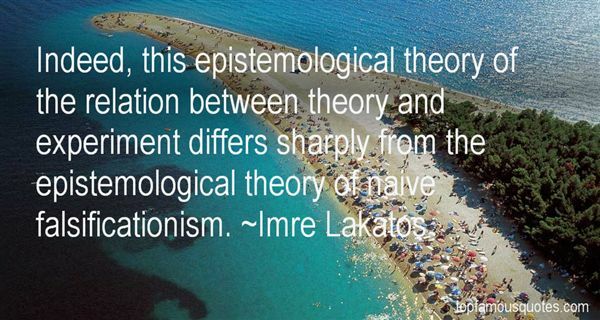 "There is no falsification before the emergence of a better theory." 10. "Indeed, this epistemological theory of the relation between theory and experiment differs sharply from the epistemological theory of naive falsificationism." 11. "Writing always means hiding something in such a way that it then is discovered; because the truth that can come from my pen is like a shard that has been chipped from a great boulder by a violent impact, then flung far away; because there is no certitude outside falsification." 12. "Once the process of falsification is set in motion, it won't stop. We're in a country where everything that can be falsified has been falsified: paintings in museums, gold ingots, bus tickets. The counterrevolution and the revolution fight with salvos of falsification: the result is that nobody can be sure what is true and what is false, the political police simulate revolutionary actions and the revolutionaries disguise themselves as policemen. "And who gains by it, in the end? "It's too soon to say. We have to see who can best exploit the falsifications, their own and those of the others: whether it's the police or our organization. "The taxi driver is pricking up his ears. You motion Corinna to restrain herself from making unwise remarks.But she says, "Don't be afraid. This is a fake taxi. What really alarms me, though, is that there is another taxi following us. "Fake or real? "Fake, certainly, but I don't know whether it belongs to the police or to us." 13. "Life, it is true, is a process of decisions and alternatives, the conscious awareness and acceptance of limitations. Experience, nevertheless, to say nothing of history, seems clearly to indicate that it is not possible to banish or to falsify any human need without ourselves undergoing falsification and loss." 14. "Articulation! There, by Joe, was MY absolute, if I could be said to have one. At any rate, it is the only thing I can think of about which I ever had, with any frequency at all, the feelings one usually has for one's absolutes. To turn experience into speech - that is, to classify, to categorize, to conceptualize, to grammarize, to syntactify it - is always a betrayal of experience, a falsification of it; but only so betrayed can it be dealt with at all, and only in so dealing with it did I ever feel a man, alive and kicking." 15. "Every time we proceed to explain some conjectural law or theory by a new conjectural theory of a higher degree of universality, we are discovering more about the world, trying to penetrate deeper into its secrets. And every time we succeed in falsifying a theory of this kind, we make an important new discovery. For these falsifications are most important. They teach us the unexpected; and they reassure us that, although our theories are made by ourselves, although they are our own inventions, they are none the less genuine assertions about the world; for they can clash with something we never made." 16. "Praxeology is a theoretical and systematic, not a historical, science. Its scope is human action as such, irrespective of all environmental, accidental, and individual circumstances of the concrete acts. Its cognition is purely formal and general without reference to the material content and the particular features of the actual case. It aims at knowledge valid for all instances in which the conditions exactly correspond to those implied in its assumptions and inferences. Its statements and propositions are not derived from experience. They are, like those of logic and mathematics, a priori. They are not subject to verification or falsification on the ground of experience and facts." 17. 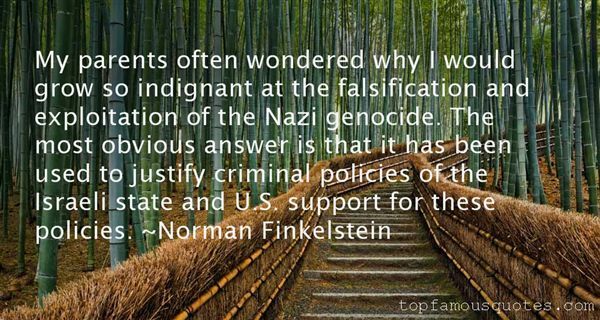 "My parents often wondered why I would grow so indignant at the falsification and exploitation of the Nazi genocide. The most obvious answer is that it has been used to justify criminal policies of the Israeli state and U.S. support for these policies." 18. "This then, I thought, as I looked round about me, is the representation of history. It requires a falsification of perspective. We, the survivors, see everything from above, see everything at once, and still we do not know how it was."